It's not enough that I embarass myself on a daily basis in front of people. I have expanded my audience, for now I am a Dork in front of the Animal Kingdom as well. I have always been an animal lover; but sometimes I don't think they would quite believe it. Especially if our cats had anything to say on the subject. "Beware the fluffy slippers. They may look soft and innocent, but they are not. They are Weapons of Mass Destruction. And never park behind her when she's wearing them in the kitchen" they would warn. "Not if you want to keep your tail intact." Okay, I WILL admit to stepping on a few tails in my day... but in my defense they DO have a nasty habit of sneaking up on me when I'm making dinner, waiting for food to drop from the sky. When I'm not tripping over the three felines, our dog feels the pain of my bungling ways too. "Yup. Here I am her faithful lapdog... an "Inside Dog". And she just LEFT me out there! In the snow! In the cold! I ran around the back yard for hours, chasing bunnies and digging in the snow. But did she remember me? Did she even CARE?" "Nooooo... She's just lucky it wasn't 40 below. I would have frozen my cute floppy ears off!" I love them. Really I do. But I do find I spend an inordinate amount of time apologizing, hugging and heaping treats on the little furballs in hopes of forgiveness for my various shortcomings. They'll just have to come to sad fact that they have a Dork for an owner, that's all. I like cats and dogs equally well, but I do take in to calculation that if I move suddenly, I may step on one of them, so I move slowly. There is no fast walking through this apartment! I haven't left any of them out in the cold yet, but have locked a cat in the closet for a day. She didn't seem too upset, at least she wasn't traumatized. She slept on a stack of sweaters and was quite comfortable. Too funny. I believe that they laugh at us behind our backs. What sweet fur-babies! Thanks for sharing them with us, bruised tails and all! Cheers from the Weekend Blog Hoppers! Those pictures are adorable! Don't feel bad. Just today I accidentally stabbed my cat Shadow in the face with a fork. But it's her fault. She hangs out in the sink waiting for the faucet to be turned on. Another time I inadvertently locked my cat Stinky in the garage -- overnight! Poor thing was a dirty mess when we brought her in. And, last but not least, I locked our third cat in the powder room. All day. He had nothing to do in the dark except to unravel and chew on an entire roll of toilet paper. I'm going to hell, I'm sure of it. Did my dog apologize to me for puking in the hallway and letting me step in it this morning? NOOOOO. Stepping on her tail is just my way of getting her back. I save myself the apologies by not having any cats or dogs. I'd probably spend their whole lives apologizing to them for one thing or another. Now I can't speak for the cats, but thank goodness dogs know nothing but unconditional love. Well, I dunno about your cats, but one of mine practically BEGS to be stepped on every day. PLEASE! Stomp my tail! Wait, am I not in an inconvenient enough spot??? Hold on, let me move my tail DIRECTLY under your shoe!! VERY cute picture & love the captions too!! My dogs could have written the same thing about me! My fifty pound dog has perfected the art of stopping right in front of me. I am constantly tripping over him! I love the pictures. Cute puppy! Why is it that whenever we feel guilty for something we have inadvertantly done to our pets we always heap tons of treats upon them? I do the same thing and then afterwards I think to myself, what if they get themseleves into these situations on purpose because they know we will feel bad and give them treats? Love your pics and pic comments - hilarious. That doggy is so damn cute!! Phoenix5: Thanks! The dog is a “Heinz 57” as it were. She’s a mix of some kind of Terrier that we adopted from the Human Society at just 4 weeks old, poor thing. She is now nearly 11 years old! Sweet Irene: Ah, yes, a fellow pet owner who knows “the moves”… I always have to double check that someone isn’t lying on the stairs before I take laundry to the basement; otherwise we’d BOTH be in for a big surprise! Awww… about your “closet cat”. You’re right, though. She probably loved it! Stacey: Hope you had a great Blog Hoppin’ weekend too! Tara: I believe they DO laugh at us too… when we’re not around, that is. Bookmama: Thank you… they are fun. Kathy: Ouch! Poor Shadow! Two of my cats LOVE water from the tap too. First they drink, then they play “Cat Water Park” and splash around. Weird felines. Aw, poor Stinky! But at least it doesn’t get as cold there as up here… Har about the toilet paper! One of our cats has a paper fetish too… That was hilarious. And no, you’re not going to Hell, cause you ARE an animal lover. Momo Fali: Ha! My dog greeted me home from work the other day with a few upchucks too… luckily she was smart enough to hit the tile floor, not the carpet. Mamma: Yes. Dogs will always love you, no matter what. Cats come around too; it just takes them longer. Jill: Har! I know EXACTLY what you mean!!! Thanks! Megan: Wow. A 50 pounder… that WOULD be quite the speed bump! 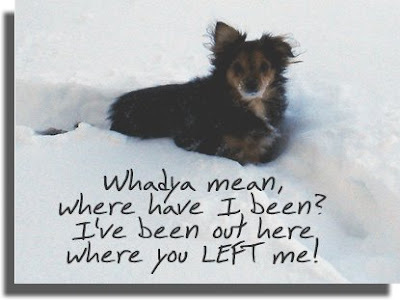 Ashley: Sorry to hear I am not alone… hopefully the little Yorkie will learn! I think that is the best thing about having a pet...they love you unconditionally NO MATTER WHAT!! 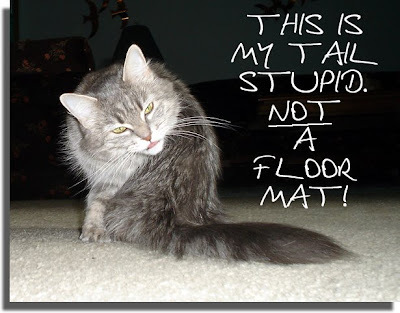 gosh if my dear cat held a grudge for such offences I would be screwed...and she would be homeless...lmaoooooooo. One of the saving graces of pets.....they have very short memories....and forgive in an instant.